Discrimination against women is not new in India; it’s an historical phenomenon. You will be surprised to know that for the same amount of work, women are paid 62% less than males in our country; only 30% of women are economically active in India and between 2009 and 2010, it was found that only 13.8% of urban workers in India are women, while in rural areas, 26.1% of all workers are women. Such huge gender disparity in Indian working environment and jobs is costing us a fortune. 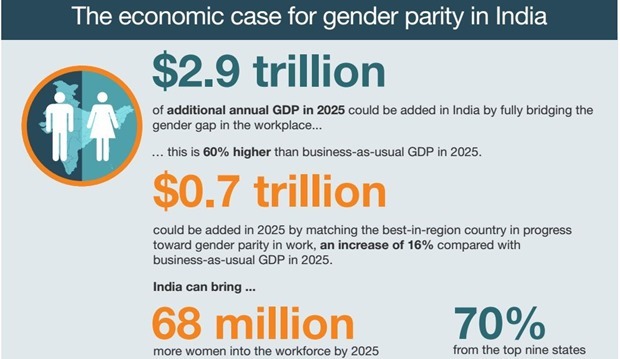 In fact, as per a recent McKinsey report on gender parity, it was revealed that India may lose Rs 46 lakh crore by 2025, if this wide scale inequality is not rectified. By improving gender equality in jobs and working culture, India can add $700 billion or Rs 46 lakh crore to its GDP by 2025. The report titled “The Power of Parity: Advancing Women’s Equality in India” says that if India can raise female labor force participation (both urban and rural) by 10 percentage points, from 31% now to 41% by 2025, we can easily accomplish an increase of 70% of this GDP improvement. In simpler terms, this means addition of 68 million new jobs of women by 2025. The other issue with gender parity in India is the amount of unpaid work done by women, which includes taking care of family, children and more. Globally, women spend 3 times the amount of time spent by men on unpaid work, while in India, its massive 10 times. The report mentions that if the amounts of unpaid work done by Indian women are compensated and calculated, it can add Rs 20 lakh crore to India’s GDP, annually. Working on 15 gender equality indicators, and focusing on various gender parity related issues, McKinsey has created a Gender Parity Score or GPS to measure where each country stands on a scale of 0.00 to 1.00; where 1 is the stage where gender parity is achieved optimally. 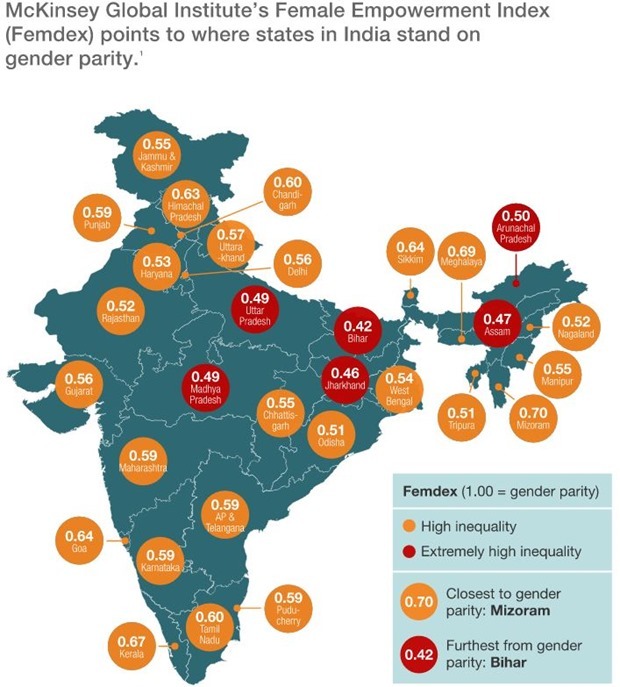 In this ranking, India has scored a dismal 0.48, which is “extremely high level of gender inequality”. Comparably, Western Europe scores 0.71 while North America and Oceania scores 0.74. 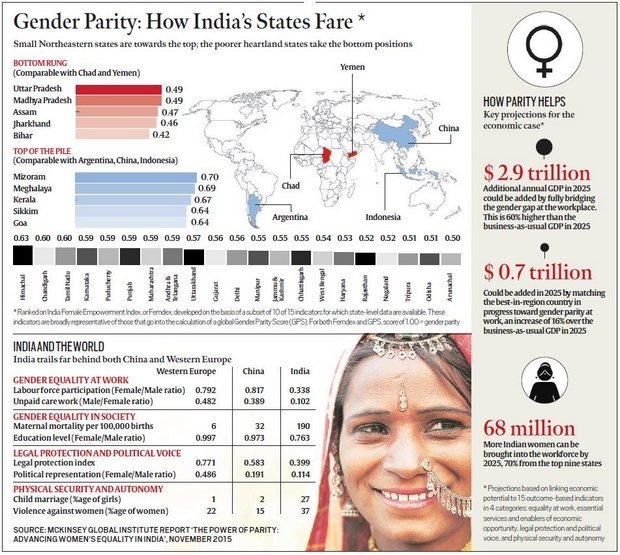 Inside India, Uttar Pradesh, Madhya Pradesh, Assam, Jharkhand and Bihar display the worst numbers for gender equality while Mizoram, Meghalaya, Kerala, Sikkim and Goa showcase the best numbers. Globally, if every country in the world achieves a GPS of 1.00, and implement gender parity everywhere, then $12 trillion could be added to the world economy. Some of the steps suggested by McKinsey to improve gender parity includes: closing gaps in education, creating equal opportunities at work, encouraging women entrepreneurs, establishing gender equal policies by Government, enforcing legal aspects of gender parity and more. "India May Lose Rs 46 Lakh Crore Due To Gender Inequality: McKinsey", 5 out of 5 based on 1 ratings. Mobile Market in 2012, What India bought Online? Average Online Advertising Rates in the world – India 66th! Women In INDIA: Empowered, Really??? Even when India is making advancements in is economic as well as scientific realms, it is indeed shameful that our country is still far behind in gender parity, which is a serious issue not only economically, but also socially. Gender stereotypes in career play a major role in pulling India back from such advancements.